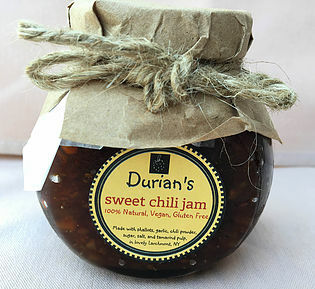 Our sweet chili jam is spicy and made from all natural ingredients — shallots, garlic, chili powder, sugar, salt, tamarind pulp, and canola oil. No preservatives. Great with bread, crackers or crudite. Available in 5 oz. jars for $12.00 + 7.95 shipping and handling. Place your orders in “contact us”. Copyright © 2018 Durian. All Rights Reserved.